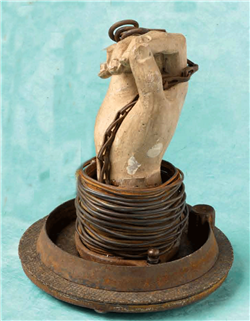 One of my most favorite ingredients to use in my artwork are found objects. In fact, sometimes I think the process of hunting for and finding discarded and forgotten items is more fun than actually using them. And once I start sharing stories about the hunt, I could go on forever. 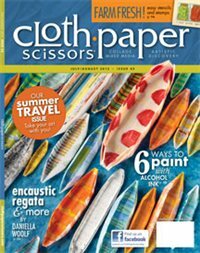 In the current issue of Cloth Paper Scissors I get to do all that and more! Turn to page 68 and you will find my feature The Lifecycle of a Found Object. Maybe it should have been titled All You Wanted to Know About Found Objects* But Were Afraid to Ask. In this article you will see photos of the hunt and of some of my favorite finds, a list of my favorite haunts in NYC to hunt for the goods, my thoughts as to why found objects are so popular, and 3 artworks created primarily with found objects. You will also find a list of 3 of my favorite commercial products to use to alter the surface patina of found metal objects -- with before and after photos included. Now that is my kind of reveal! Wow, why did I not know about your blog? Great work, Seth. Loving the "Pacifist". Am following you now. Sorry for long delays in commenting. Too much on the plate. I wish I could have taken the tour on Sunday, but I was in the dial-up desert and hadn't the patience. I'm still following Seth, and always enjoy at least the read if not the Candy. Okay. I go right for the Candy. A great and informative article-thank you for sharing the info & techniques...beautiful assemblages! I know what you mean about "the hunt"-so much fun-I found some very cool stuff yesterday. Congratulations again Seth, so well deserved. I've just downloaded the magazine to my Ipad so I'm all set for a read. I totally agree about the finding of the found object, I have a HUGE drawer of found objects, but now they're found they sit patiently waiting. Great article!!! Someday I'd like to go "pickin" with you! Hi Seth, the chase and the hunt are my favorites too! Although it's rewarding when you find the perfect setting for those found objects. I agree, the hunting and gathering are almost the best part! Loved the article too. I get the digital version of CPS and you've given me ample reason to open it! Love that you love the hunt! Another great article Seth...well done! Love the way you use 'stuff'... and give it a new life. Eventually, will you start to make your own found objects so they will fit your vision more exactly? I think that's what happen to Thomas Mann (the jewelery, not the author). Really enjoyed this article, Seth! You're an excellent writer, as well.